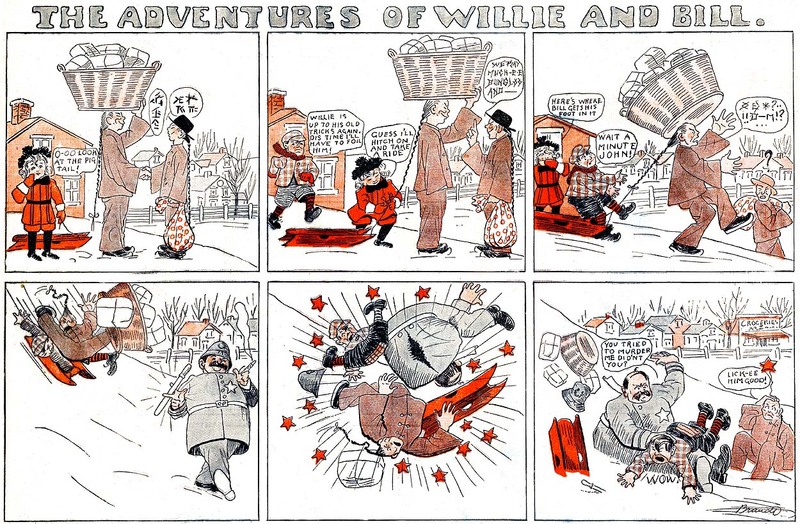 The Chicago Tribune‘s Sunday comic section of the 1910s was a pretty high-class affair. Between Frank King, Penny Ross and Sidney Smith they had some of the brighter lights of the cartooning world gathered together in their pages. One glaring exception was a fellow named Brandt, who had the good sense not to divulge his first name. His artwork was horrendously bad, sticking out like a sore thumb in the Trib’s Sunday section. His only contribution (thank goodness) to the section was The Adventures of Willie and Bill. The premise of the strip is that Bill, the poor kid, and Willie, the rich kid, are fellow prankmeisters. Bill is a little more reticent about pulling dangerous stunts than Willie, who is completely out of control. The gag, such as it is, is that Bill usually suffers all the consequences for their escapades. 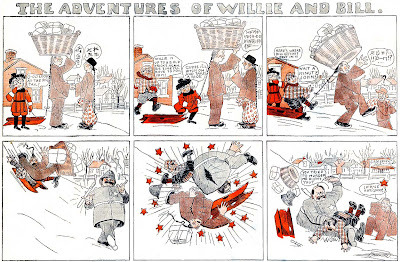 Miraculously, this awful strip lasted over a year in the Tribune, from December 24 1911 to January 26 1913. I’m left wondering if Brandt was a relative of McCormick or Patterson — I can think of no other explanation for its longevity. Oh, one noteworthy item — in the third sample above you’ll find a guest appearance by Penny Ross’ Mamma’s Angel Child. Thanks to Cole Johnson who provided the scans. He’s lucky the scanner didn’t break when it saw these! And that brings to an end Willie Week on the Stripper’s Guide blog. The point is that cartoonists in the 1890s-1910s had a fascination for that name. Practically every second kid in the comics of those days was named Willie. I don’t exaggerate that I could easily make this Willie Month if I put my mind to it. The habitual use of the name actually causes problems for we indexers. 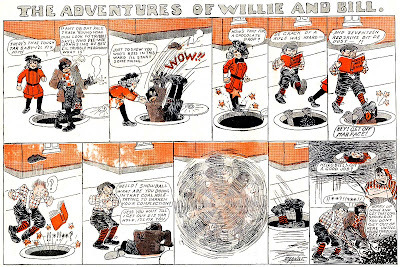 When looking through early material, say before 1905, when series strips were much less ubiquitous, you might have the same artist draw comics featuring a kid named Willie over and over. The question then becomes, “Is it a series?” I can’t tell you how many times I’ve had to put the ol’ microfilm reel in reverse gear because of “Willie problems”. Is it the same kid or is the cartoonist just enamored with the name? Same problem, to a lesser extent with blacks named Sambo and Rastus. All those names were used as shorthand to indicate types, a prized commodity in an art form where brevity truly is the soul of wit.